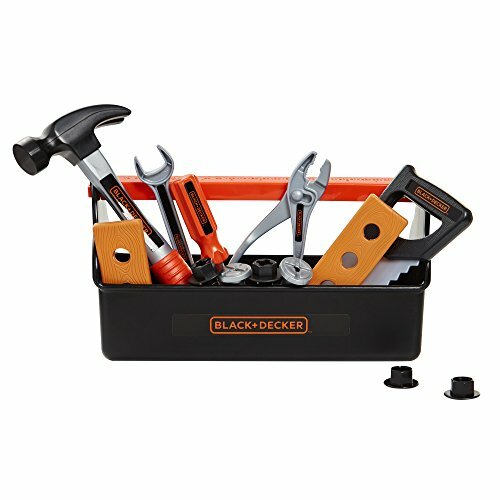 The Black & Decker Toolbox is the perfect gift for your little builder. It features 15 tools and accessories all in a handy tool box. Your little one will love carrying his tools to his next project. Includes hammer, screw driver, kid safe saw, wrench, ruler and other assorted tools. Recommended for kids ages 3 and up. Black + Decker Jr. My First Toolbox is the perfect gift for your little builder! Features 15 tools and accessories with handy tool box. Tools included are, hammer, screw driver, kid safe saw, wrench, ruler and other assorted tools. Your little one will love carrying his tools to his next project.